FUNimation Entertainment is proud to announce today its distribution of the theatrical, home entertainment, video on demand and broadcast rights to the upcoming Japanese live-action feature film Attack on Titan across the Americas (North America, Central America and South America). The film will be released by Toho Co. Ltd. in two parts in Japan on August 1 and September 19, 2015. Series creator Hajime Isayama worked directly with the film's producers to create the screen adaptation. Attack on Titan is based on the popular manga series of the same name ("Shingeki no Kyojin" in Japanese), which tells the story of a world where most of humanity has been destroyed by giants and where the last of mankind fights to survive behind three concentric walls - walls that were once impenetrable to the giants. With more than 50 million copies in print today, Attack on Titan has also inspired four spin-off manga as well as a 25-episode anime series which FUNimation both simulcast and released to home video in North America. Attack on Titan director Shinji Higuchi will be making a special appearance at San Diego Comic-Con (SDCC) for an autograph session with fans on Sunday, July 12, at 1:00 p.m. PST at FUNimation's booth (#4135). Following SDCC, FUNimation Entertainment and Toho Co. Ltd. will host the world premiere of Attack on Titan (Part 1; in Japanese w/ English subtitles) at the Egyptian Theatre in Los Angeles, CA on Tuesday, July 14. 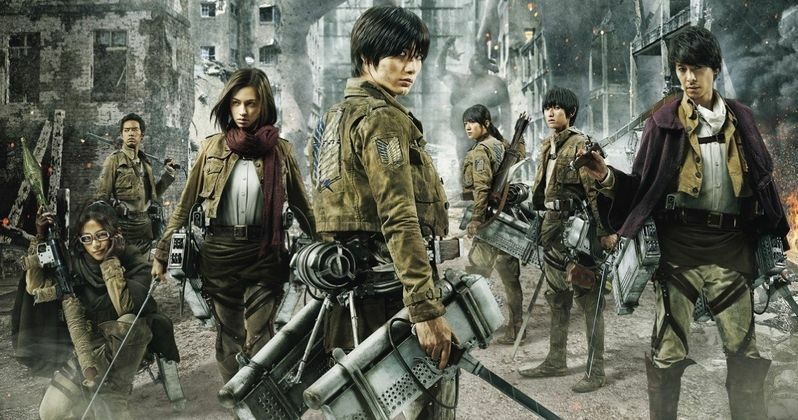 The SDCC special appearance and premiere are being held to promote the August 1 release of part 1 of the film in Japan and will include a red carpet event featuring special guests - Haruma Miura and Kiko Mizuhara, who portray Eren and Mikasa in the movie respectively, along with director Shinji Higuchi. Here's what Gen Fukunaga, CEO and President of FUNimation Entertainment, had to say in a statement. "FUNimation is honored to host the world premiere of Attack on Titan here in the United States with Toho. Attack on Titan is truly a worldwide phenomenon and we are excited to bring the live action movie to theaters across the Americas later this fall." Invited guests to the premiere, including celebrities and media, will be among the first in the world to see Attack on Titan. A limited number of tickets will be available to fans via FUNimation's social channels. Like us on Facebook at Facebook.com/DragonBallZ & Facebook.com/Funimation, and follow us on Twitter at @Funimation. Check out the new photos from Attack on Titan below, and stay tuned for more details on the animated movie's North American release through FUNimation.